Schell Games, a full-service game design and development company based in Pittsburgh, recently released a video trailer for its upcoming educational virtual reality (VR) game that seeks to better engage high school students in chemistry concepts. According to Schell Games CEO, video game designer and author Jesse Schell, SuperChem VR is “designed to allow you to learn about these concepts in a safe, interactive and immersive way,” he commented in the trailer. The game's narrative puts users inside a broken down spaceship. To survive, they must find and utilize the correct lab equipment to complete actual scientific experiments — like lighting a dark hallway with a glow stick, for example. To know how well the liquid reaction for the glow stick was prepared, users will be asked to test the reaction in a virtual substance analyzer that calculates the percentage of the reaction that was created correctly. The user will also receive reaction notes that detail steps to identify the experiment's margin of error for future tests. If needed, users can receive help from the game's “ChemBot,” or virtual assistant that helps reinforce proper lab conduct and practices. Schell Games was previously awarded $1 million for a two-year grant from the ED in 2015 to advance the way molecular chemistry is taught in high school classrooms. The company released Happy Atoms, an iPad app-based chemistry learning tool designed to teach molecular modeling to students as young as grade 4 and up to the college level. The app pairs with plastic and silicone atom models that connect easily via magnets. 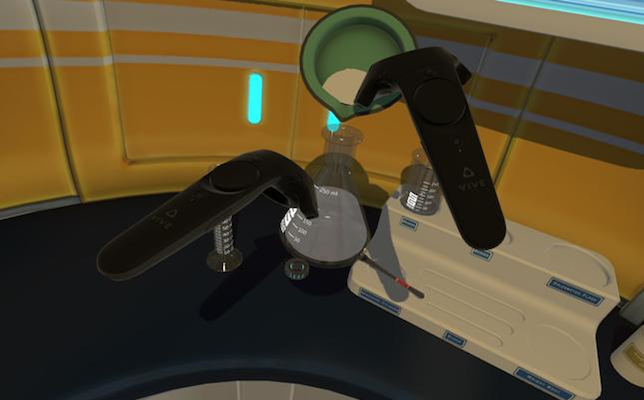 SuperChem VR, however, wants to deliver these core chemistry concepts in a completely immersive educational experience. There is no release date or price listed yet. Learn more by watching the video below or visiting the game site.